This is Mark Corbett's blog. In deciding which view is correct, we should of course prayerfully seek to understand all that the Bible teaches on the final fate of the unrighteous. However, sometimes a single verse has particular importance for a given issue and is worthy of special focus. There are a number of verses like this with respect to the nature of final punishment. In this post I will to focus on one of these: Matthew 25:46. This verse comes at the end of a teaching on the final judgment. We see all humanity standing before the judgment seat of King Jesus. Humanity has been divided into two groups: the righteous (symbolized by sheep) and the unrighteous (symbolized by goats). In this verse Jesus declares a different fate for each group. 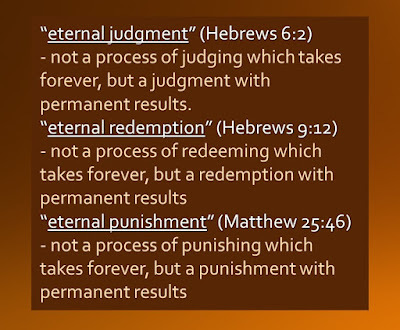 An examination of the two phrases He uses, “eternal punishment” and “eternal life,” reveals that this verse rules out both eternal conscious torment and universalism while supporting annihilationism. 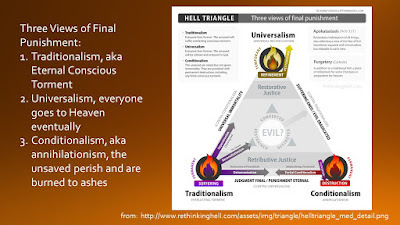 Any type of punishment which is eternal obviously rules out universalism. Since some people suffer a punishment which lasts forever, these people are never saved. The universalist response has been to claim that the Greek word translated “eternal”, aionios, really means something else. Various options are offered. 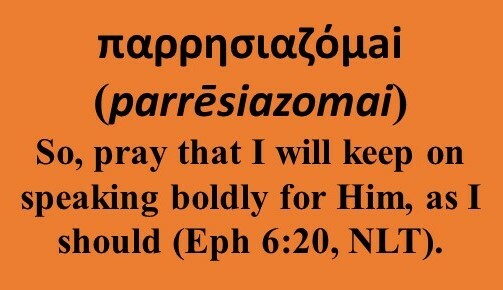 However, all major English Bible translations have translated aionios as either “eternal” or “everlasting” in this verse for very good reasons. One rather obvious reason is that the same word aionios is used to describe both the life of the righteous and punishment of the unrighteous. There is a lot more evidence that our Bible translations are correct. I wrote a three part blog series on the meaning of aionios. You may begin by reading part 1 here if you want more details. LXA 2 Maccabees 4:38 And being kindled with anger, forthwith he took away Andronicus his purple, and rent off his clothes, and leading him through the whole city unto that very place, where he had committed impiety against Onias, there slew he the cursed murderer. Thus the Lord rewarded him his punishment (kolasis), as he had deserved. note: the above quote from Wisdom 19:4 refers to the Egyptians who perished in the Red Sea, which was hardly a punishment intended to reform them! Other examples of kolasis referring to the death penalty may be seen in 3 Maccabees 1:2-3, 3 Maccabees 7:10-12, and 4 Maccabees 8:8. It appears that kolasis, like the English word “punishment”, can apply to a wide range of types of punishments. 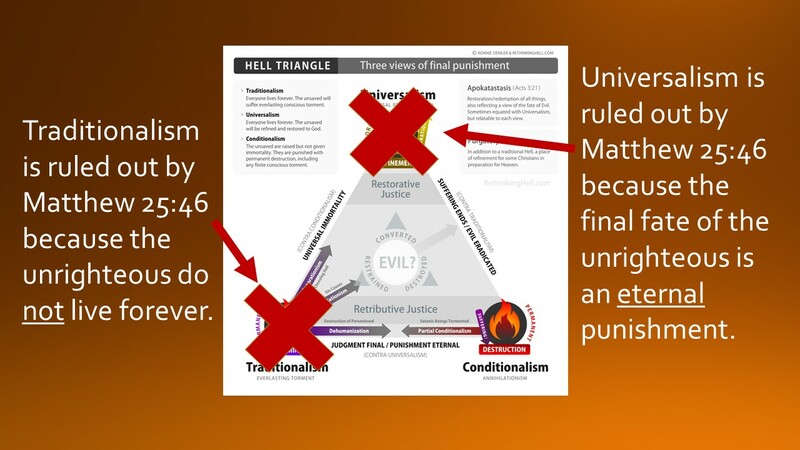 Of course, any type of punishment which is eternal will rule out universalism. Many traditionalists wrongly point to Matthew 25:46 as a verse which supports eternal conscious torment. On closer analysis, not only does this verse not support eternal conscious torment, it actually rules it out. One reason traditionalists often think Matthew 25:46 supports their view is that they only consider one type of “punishment”. The only type of punishment they consider is torment. Without question, torturing people forever would be a type of “eternal punishment”. However, there are other types of punishment. In our justice system today, the most severe punishment is considered to be the death penalty. The methods used to kill prisoners do not involve torment. The death penalty is not considered the most severe penalty in our system because of any pain it inflicts, but because it permanently (from a human prospective) deprives the prisoner of life. The punishment is serious because of what the prisoner misses out on, not because of the pain experienced. In a similar way, an eternal death penalty is an extremely severe penalty, not because of the pain experienced (although there may be some pain in the process of being destroyed), but primarily because the person who perishes misses out on an eternity full of the glorious joy of being with God in His perfect new world. Some traditionalists object to viewing eternal death as a type of eternal punishment because while the result of such a punishment is eternal, the process of punishing is not. 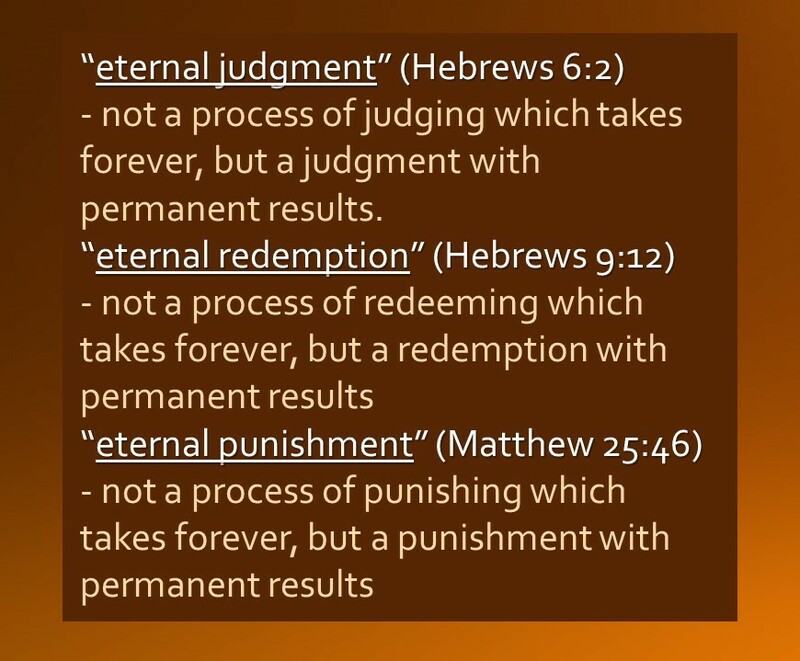 However, the word “eternal” is used in the Bible to describe other situations where the process is not eternal but the result is eternal. The soldiers who courageously held back the enemy were given medals, but those who fled were required to do extra work. Question: Did the soldiers who flee get medals? Question: Do “these” (the unrighteous) receive eternal life? It’s so obvious once you see it. ONLY the righteous will live forever. The unrighteous do NOT receive eternal life. You can’t torture a dead person. The only punishment which is eternal and which does not require eternal life is eternal death. Thus, eternal conscious torment is ruled out by a proper understanding of Matthew 25:46. 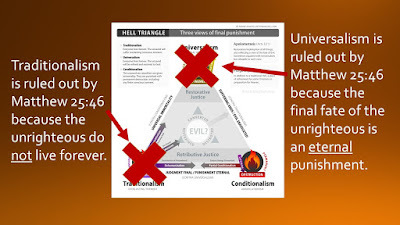 Correctly understood, Matthew 25:46 rules out both eternal conscious torment (traditionalism) and universalism. That leaves conditionalism (annihilationism) as the only remaining viable view. This conclusion is confirmed by the rest of the Bible. Whole books have been written on this, but here I’ll just quickly point to three ways the rest of the Bible confirms what we have seen in Matthew 25:46. 1. The Bible very consistently teaches that ONLY the righteous will live forever, by God’s grace in Christ Jesus. There is not a single verse from Genesis to Revelation which teaches that all people will live forever or that the souls of the unsaved are immortal. Immortality is a gift freely given by God to those who have faith in Christ. This is why annihilationism is also called conditional immortality! 2. Contra the claims of universalists, the Bible does not teach that the purpose of final punishment is corrective or redemptive. The Bible specifically and repeatedly teaches that final punishment consists of God paying back and expressing vengeance on the unrighteous. This payback is proportional to the sins committed, and thus cannot consist of eternal torment. But it does terminate in the unrighteous being burned to ashes and perishing. 3. The language the Bible uses to describe the fate of the unrighteous is a far better fit for annihilationism than it is for either universalism or eternal conscious torment. The Bible tells us that the unrighteous will suffer “death” (Romans 6:23), “perish” (John 3:16), be destroyed in both body and soul (Matthew 10:28), suffer “eternal destruction” (2 Thessalonians 1:9), be burned to ashes (2 Peter 2:6), and “will be no more” (Psalm 37:10). The verses listed here are only a small sample of similar language used consistently to describe the final fate of the unrighteous. Like the rest of the Bible, Matthew 25:46 teaches that the final fate of the unrighteous is annihilation, not salvation as the universalists say nor eternal torment as the traditionalists say. Although these thoughts may be new to some who read them, they are not original with me. I’ve benefited from the insights of many conditionalists before me and from articles on Matthew 25:46 like this one and this one at Rethinking Hell. Hebrews 13:16 And do not forget to do good and to share with others . . .
That makes sense in isolation - but what of other verses that indicate conscious torment? What about Jesus' story in Luke 16:19-31 of the rich man in hell- in torment ? "23 In Hades, where he was in torment, he looked up and saw Abraham far away, with Lazarus by his side." .. or Revelation 20:10 "and they will be tormented day and night forever and ever"
Cary, you ask some great questions. Of course, we should always seek to interpret Scripture with Scripture since it is all God’s Word and all works together harmoniously. 1. We don’t know if it is a literal story of actual events or a parable using a fictional story (but with some true elements in it). 2. Even if it’s a true account (which I think it may be), some elements in the story may be symbolic. Would a drop of water really help someone in the Rich Man’s condition? Wouldn’t it just sizzle away in a couple of seconds? Would he be able to talk if he was literally in fire? It’s hard to say how much is symbolic. 3. Even if it is entirely literally true (which is possible), it is describing the intermediate state and not the final state. It is describing the condition of people in between the time they die and the time of the resurrection and judgment day. Nothing in the story says that the Rich Man will remain in fire in torment forever. In fact, nothing says he will even remain in conscious torment the entire time he is waiting for judgment day. Please don’t hesitate to follow up with more questions! Thanks. So, then, do you see Rev 14 in the same way as Rev 20? Seems like numerous verses indicate a "forever" torment- not a forever extinction. Cary, thanks for asking about Revelation 14. Short answer: Yes, I see Rev 14 in the same way as Rev 20. Medium length answer: It may feel like there are "numerous" verses indicated a "forever torment", but I'm pretty sure there are only two. You've identified both of them, one in Rev 14 and one in Rev 20. It only takes one verse to make something true. But, sometimes we are interpreting a verse or verses incorrectly. Revelation 14 and Revelation 20 each contain images where "forever" is linked with "torment". On the surface, this seems to be in conflict with verses which teach that the final fate of the unrighteous is to perish (John 3:16), have their souls and bodies destroyed (Matthew 10:28), and be burned to ashes (2 Peter 2:6). I've become convinced that the reason for this apparent discrepancy (there is never an actual contradiction in Scripture) is that Revelation is full of symbolic visions. These symbolic visions sometimes use what we might call symbolic hyperbole. Extreme and shocking images like seven headed monsters, dragons trying to eat babies, a prostitute drunk with blood riding on a hideous beast, and a huge sea of blood (which if literal would contain far more blood than all the people who have ever lived) are examples of these shocking images. Simply interpreting these shocking images as if they are literal pictures of the future will often lead us astray. This is not true only for Revelation. Consider the dream Pharaoh had of seven skinny cows eating seven fat cows (Genesis 41). In Pharaoh's future there were no actual cannibalistic cows. Or consider Nebuchadnezzar's dream of a giant statue made of gold, silver, bronze, and iron (Daniel 2). There was no literal statue like that. Likewise, many of the things John sees are symbolic visions. The visions must be understood in the light of the rest of Scripture, and the rest of scripture does not teach eternal conscious torment, it very consistently teaches that the unrighteous will eventually perish. Gary, I read your article you linked to. But I'm still not sure what point you are trying to make in your comment above. Did you actually read my article? Yes, I read your article. I am aware that you do not believe in Hell and I applaud you for that. Your intelligence and reason have told you that punishing people for what they believe with eternal damnation is immoral. But I now ask you to use your intelligence and reason to go one step further: belief in invisible beings is illogical. The Judeo-Christian god does not exist. Free yourself from belief in ALL supernatural-based superstitions, Mark! Gary, I'm willing to interact with you about the existence of God and my Christian beliefs. But we need to respect each other. Your comment implies that I must not be using intelligence and reason when I believe in God. Let's avoid that kind of subtle ad hominem argument. Also, while I do not believe in eternal torment, I do believe in Hell as a place where the unrighteous will be destroyed. About Me : By God’s grace I am a child of God and a servant of our Lord Jesus Christ. I am a husband to Hope and a father to Joy. I serve as the pastor of Severn Baptist Church in Severn, NC. One More Night with the Frogs? Do you serve a 54 inch god?